Over the last three seasons, Martin Raymond guided the McGill Redmen to a pair of Ontario University Athletics eastern conference titles, including the 2008 Queen's Cup league championship, the team's first since 1946. Photo by Andrew Dobrowolskyj courtesy of McGill Atletics & Recreation. After 14 seasons as head coach of the McGill University men’s hockey team, Martin Raymond has stepped down to accept an appointment as assistant coach to Guy Boucher with the Hamilton Bulldogs, the American Hockey League farm team of the Montreal Canadiens. Raymond was named along with Daniel Lacroix, an assistant coach with the New York Islanders for the past three seasons. Raymond becomes the fifth former McGill hockey player to make the move up to the AHL coaching ranks. He joins Boucher, a McGill grad who played for and coached alongside Raymond with the Redmen. Others to make the jump include George Burnett (Cape Breton, 1992-94; Binghamton, 1995-97), Jamie Kompon (Baltimore; 1996-97) and Mike Babcock (Cincinnati; 1999-01). All three eventually coached in the National Hockey League. 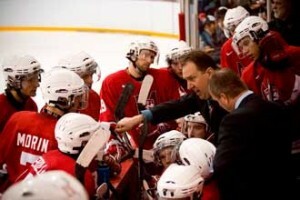 Raymond, a 42-year-old native of Pierrefonds, Que., and current resident of St-Basile-le-Grand, Que., is the most successful coach in McGill hockey history. He has posted a 293-192-35 record in 520 games overall with the Redmen, including a stellar 206-110-30 regular-season mark (.638) since he took over the coaching duties from Jean Pronovost midway through the 1994-95 season. “I am excited at this opportunity to help develop the young players of the Montreal Canadiens organization with Guy and the staff in Hamilton,” said Raymond, who has won OUA East coach-of-the-year honours four times and in 2005-06, became the first McGill coach to win the Father George Kehoe memorial award as CIS coach of the year in men’s hockey. “From the time I was a child, my father and I were always big Canadiens fans. So I look forward to this challenge and hope I can make a difference for their farm team in Hamilton. Over the last three seasons, Raymond guided the Redmen to a pair of Ontario University Athletics eastern conference titles, including the 2008 Queen’s Cup league championship, the team’s first since 1946. He has produced 28 players who have gone on to playing careers in pro hockey, including one who reached the NHL (Mathieu Darche) and five in the AHL (Darche, plus Greg Davis, Pierre Gendron, Daniel Jacob, David Urquhart). Raymond and Boucher would reunite with Darche in Hamilton, should the former Redmen winger fail to make the Canadiens lineup this fall. Raymond graduated from McGill in 1992 with a physical education degree and played professional hockey in Germany (with EA Schongau) for one season before returning to McGill in 1993 to work on a master’s degree in physical education, which he completed in 1996. Prior to being appointed as bench boss of the Redmen in 1996, Raymond served for three years as an assistant coach with the team after a five-year playing career at McGill. He also served one season as an assistant to Terry Bangen, who guided the Redmen in 1995-96 before moving on to accept an assistant coaching position with the NHL’s Vancouver Canucks. Raymond also coached the Quebec provincial team to a bronze medal at the 2004 under-17 world hockey championships in St. John’s, Nfld. At the pro level, he directed the Montreal Canadiens rookie camp in 1997. As a player, Raymond earned all-conference honours three times and All-Canadian status in his final season (1991-92) when he served as team captain. He became McGill’s all-time assist leader with 144 (now ranked second) and is still third in career points (253 in 154 games) and third in career goals (109). Raymond was also a member of the bronze medal-winning Team Canada squad at the 1991 Spengler Cup tournament in Davos, Switzerland. He received the Forbes Trophy in 1992 as McGill’s male athlete of the year, and the Bobby Bell Trophy as Team MVP in 1991-92. A decision about Raymond’s successor will be made in the near future.